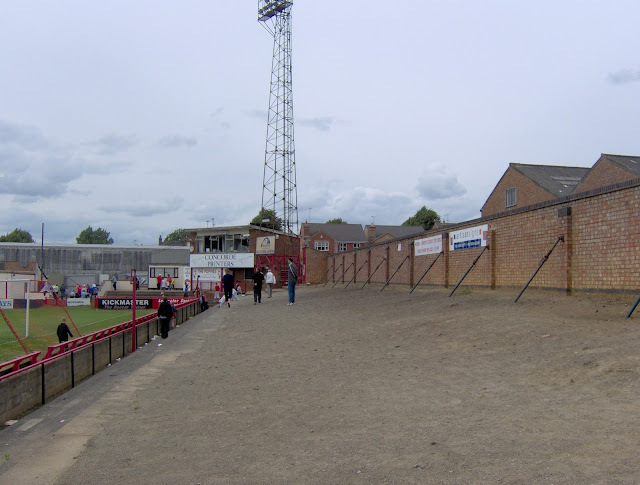 1: Rockingham Road was Kettering Town's home from 1887 to 2011 when chairman Imran Ladaak decided to up sticks and take over the vacant Nene Park, former home of local rivals Rushden & Diamonds. The club didn't actually own Rockingham Road after their 1992 financial crisis led to them having to sell the venue and lease it back. 2: In 1976 Kettering Town became the first English club to have a shirt sponsor, thanks to local firm Kettering Tyres. The FA were not receptive to this new initiative, ordering them to remove the logo from their shirts. They tried to get round the ban by shortening the wording and claiming that 'Kettering T' stood for 'Kettering Town' but the authorities saw through it. The sponsorship ban was eventually lifted the following year. 4: The record league finish for Kettering Town was 2nd in the Conference, a feat that they achieved on three occasions. 5: Kettering Town have had many notable runs in the FA Cup. The furthest they have reached is the 4th Round. In 1988/89 they claimed the league scalps of Halifax Town & Bristol Rovers before a defeat to Charlton Athletic. Twenty years later they were at it again - this time defeating Lincoln City and Notts County en route to a 4-2 defeat at home to Premiership side Fulham. 6: Kettering Town have reached the final of the FA Trophy twice. In 1979 they lost out to Stafford Rangers before losing out again in 2000, this time to Kingstonian. 7: The biggest attendance at Rockingham Road came in 1947 when 11,526 turned up for the FA Cup 3rd Qualifying Round game against Peterborough United. 8: Kettering have had a host of famous names in the dugout, with Tommy Lawton, Ron Atkinson & Paul Gascoigne amongst their former managers. 9: Before automatic promotion to the Football League became a right, clubs had to apply for election to the league board. In 1974 Kettering Town fell just 5 votes short with Crewe, Stockport, Newport & Workington being spared. 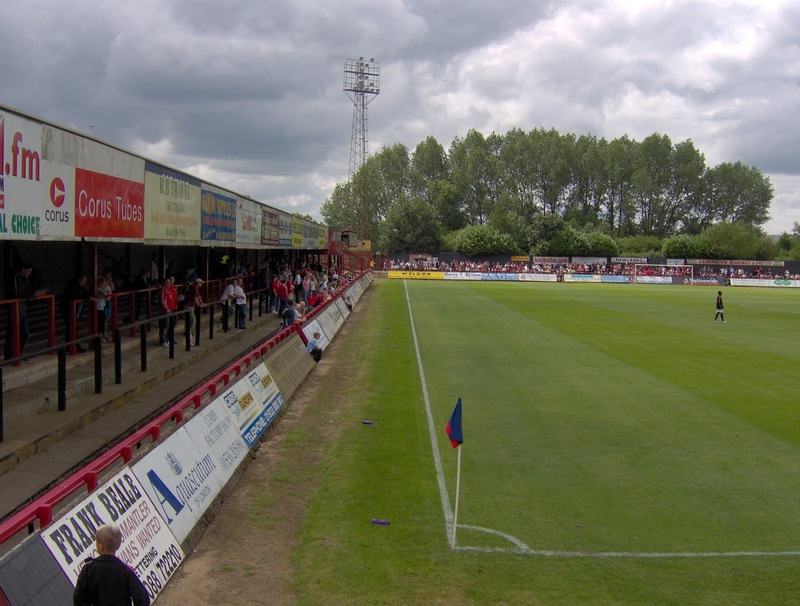 10: Since leaving Kettering have spent a short spell at Rushden's former home of Nene Park, before a groundshare at Corby Town. Since 2013, the club have played in Burton Park, a suburb of Kettering. The ground is also home of United Counties League side Burton Park Wanderers. My first and only visit to Rockingham Road was in September 1992. Wycombe were going well in the Conference, taking a swift early hold at the top of the league. Their hosts meanwhile were occupying a mid-table position but the week before had had some financial issues. 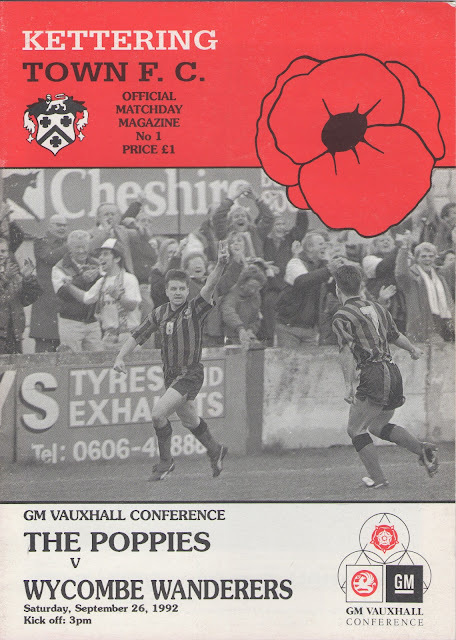 The resulted in them producing an 8-page programme for the pricey sum of £1, which was a liberty at the time. The behind the scenes problems seemed to have an effect on the home team as Wycombe coasted to a 4-0 victory on a ground they had often struggled to pick points up at. My main memory of the day was sitting in their impressive main stand which seemed huge to me at the time, and still is a decent one by Conference standards. 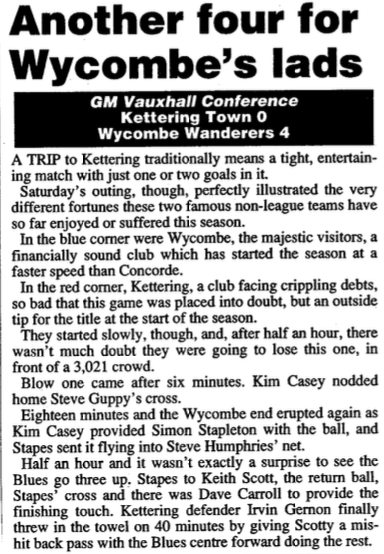 Wycombe went on to win the league with ease, while Kettering initially recovered but have been dogged by financial problems, which eventually lead to them losing Rockingham Road. The main feature of this ground was the main stand, which held a highly impressive 1800. As it didn't run quite the full length of the pitch you could get a really elevated view and with no supporting pillars too. The bulk of the away fams went on uncovered grass banking to the right but that has since changed to a more solid bit of uncovered standing. Opposite was a fair sized covered terrace which ran the length of the pitch. The other end from what I can remember was uncovered also.